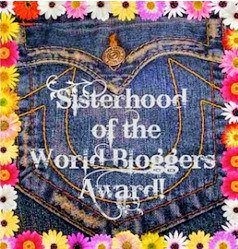 I've been tagged by Kit from a Rainbow at Night for the Sisterhood of the World, Bloggers Award & I am SUPER flattered. Kit is amazing & her blog is incredible. I tend to stay on the edges of the M.E. community, I am already spend enough time dealing with my M.E. I guess I kind of hide from too much of it. Rainbow at Night is one of those blogs that is an exception. I feel sometimes like she does the ranting for me in good way you know? It's a super cathartic blog to read because it makes me feel like I'm not alone it what I feel & that I'm....I don't know, not alone? I'm not explaining it very well but I am super flattered that she reads my blog & included me in this. 1) What made today special for you? 3) What is one thing you wish people understood about you? I'm not sure. I kind of wish....I don't know. I'll try to come back to this question. 4) Which place that you’ve visited is your favourite? P.S. a close second is North Yorkshire, it also has that real tranquillity but it's not quite the same, there is too much....compactness to it, too many people in not enough space. 5) Do you have a phrase, mantra, or quote that gets you through those exceptionally-difficult days? I always feel like I should but I don't really. I get through by just getting through you know? I just don't let myself not... Does that make even the tiniest bit of sense? 6) What are you most proud of/feeling personally accomplished about? I think I'm proudest when people get in touch to say how much the blog has helped or how much it means to them. I think of everything I've ever done, being a part of the M.E. community is the most important. 7) Do you have any creative outlets aside from writing? I never think of myself as a particularly creative person but I guess I do a lot of creative things...I guess I think if I can't draw or do art I don't count, but I knit & I play around with makeup & clothes & (when it's possible) I bake. 8) What are you doing/have you done to leave this world a better place? In the days pre - M.E. I was on school council, Leeds Youth Council & UK Youth Parliament. I did a bunch of stuff like that. These days I do this & try to stay in touch with the M.E. community. 9) Do you enjoy documentaries? 10) Is there a life tip you’d like to share? I think my best tip is "Be kind to yourself", I think most people (myself included) are a lot nicer & more forgiving to other people than they are to themselves. Laura of Me, Michael & M.E. Do you have a secret obsession? What is something you love to eat but try to avoid? Top three things on your bucket list? What post have you always wanted to write but never perfected? What was your favourite game (computer, console, board, card or playground) as a child? Who are the 4 people (alive, dead or imaginary) you would most like to invite to a fantasy dinner party? If you could pick one book, game or film universe to live in, which would it be? How do you keep going when you are really struggling with life? Also, I'd liked to subscribe to your site and get e-mails of your posts instead of remembering to check, but I don't see where I can do that. I don't use Blogger so I'm not sure where it is, or maybe it's just staring me right in the face? But it'd be a good addition to your site, if it's not somewhere already! :) Sorry if I'm just missing it! I know I am terribly behind on my reading and I'm trying to type this comment as quick as possible before my timer runs out and I go back to work haha. Awesome answers and I completely get you with the whole, you just keep going because you can't not do it. That how I've been most of my life tbh. It's worked quite well most of the time. That's my timer! Back to work for me!